With a loose theme of Thanksgiving here on the blog this month, some have written about what the Thanksgiving holiday is like in their family or country of residence. I'll continue that theme, especially since I missed it this year, and I usually love it so much. As a regular holiday, Ukraine and Russia don't really celebrate Thanksgiving. However, the churches have a special harvest Sunday called Zhatva. The sermons and special music and all focus on God's gifts to us and thanking Him for them. There's not a set date for Zhatva. In fact, often regional pastors work together to stagger the dates in the different churches, so that we can visit each other and celebrate together. Usually, Zhatva Sundays are in September, although sometimes they flow over into late August and October. Some years our family has gone to three or maybe even more Zhatva celebrations, when we've been very involved in church ministry. I especially love when we get to go out to a village to thank God for the harvest He has given there. Those village services are usually followed by a real feast, often outdoors in the lovely fall weather. Oh, and here's just one old post (one of many) about a village Zhatva on our family blog. (Can you see how our family has grown since then?!) This really is one of my favorite parts of church life here. 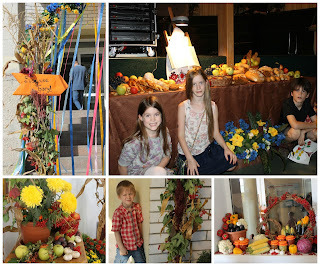 Who else out there has been to a Slavic church's Zhatva celebration? Or do churches in your part of the world do something similar? Hungarian churches in Romania, where we are, celebrate Thanksgiving Sundays too. The churches choose a Sunday sometime in Sept-Oct, and we bring fruits, vegetables, breads, flowers, etc. to display in the front of the church. Very similar to what you've described! Thanks for sharing this tradition. :) We were in Congo, and there was no celebration like that. We always did an ex-pat meal, though.